During its most recent code cycle, the International Energy Conservation Code approved provisions for the use of buried ducts as a cost effective, energy efficient alternative to installing ducts in conditioned space or creating an unvented attic. The new language, to be incorporated within the 2018 version of the code, addresses both the energy and condensation performance of buried ducts. Notably, the code specifies the minimum R-value requirements to prevent condensation (R-13 insulated ducts in climate zones 1A, 2A, and 3A; R-8 insulated ducts elsewhere), and provides guidelines for deeply burying the ducts to achieve either R-25 effective duct insulation or to meet the criteria for ‘ducts in conditioned space’ (which also requires reducing duct leakage). Buried ducts were previously discussed as a builder practice option being considered in the 2018 IECC code in the attached online Builder article1. Additionally, Home Innovation Research Labs has authored a recent TechSpec focused on buried ducts, providing greater detail around the code language, as well as an energy & cost comparison to other building practices2. 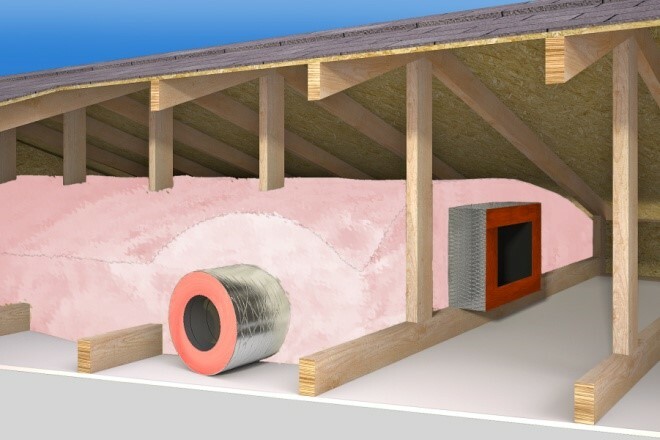 NAIMA/Insulation Institute contracted with Home Innovations Research Labs (HIRL) to conduct a free webinar “Buried Ducts: A New Path for High Performance Vented Attics”. The webinar was presented by HIRL’s Dave Mallay, who led research on the practice in support of the code change. This webinar was also sponsored in part by Green Builder®. By clicking on the word webinar above, you will be directed to the Green Builder Media’s Webinar Archive. In order to view the webinar, you must register (free of charge) with Green Builder. The webinar entitled “Buried Ducts: A New Path for High Performance Vented Attics” can be found in the archive. Simply click on “building codes” or “ducts” in the Webinar Topic section.